I’m anxious. It’s not cabin fever, in spite of how cold it has been, but rather I’m uneasy because of ALA Midwinter. I so enjoyed my time at ALA Anaheim over the summer, I am envious of what I know is an absolute blast for the authors, librarians and publishing industry employees. Especially for the authors. 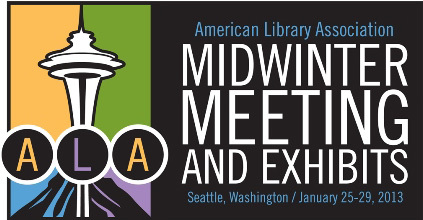 I am jealous of the atmosphere, the camaraderie, the readers, fans and immersion in everything BOOKS, that when I check the #alamw13 feed, I so want to be there. But I’m happy for those who are there, especially the authors from Running Press. I know for some they are having that first experience that I had, and it is well deserved. So I can find the silver lining, and that is good. But then there’s how I feel about the YALSA Quick Pick List for Reluctant Young Adult Readers. Tap Out is on it, along with, I believe, 100+ others. After the voting today, how much would I like to see my work on the top ten? I’m not sure how to quantify such desire. Not the same as how bad I wanted to get published, but on par with how much I desired positive reviews. And sales. But that’s the thing, being on the top ten would affect both reviews and sales. So there’s that, and the unbelievable recognition. And the quick pick list isn’t even close to the big show of the Caldecott, Coretta Scott King Book Awards, Newbery, Printz, William C. Morris and more. I cannot imagine how those nominees feel. I hope they are anxious, because I would be a knotted mess. But, in all sincerity, it is awesome that Tap Out is even on anyone’s radar. There are so many unbelievable YA books that I am lucky to have been noticed and considered. I am thankful and grateful, but also expectant. I believe this is just my nature. I strive, succeed and then strive some more. I don’t believe it’s an inherently poor way to live, but it is one that keeps me on edge, keeps me anxious and keeps me wanting more–from myself. So fingers crossed, here’s hoping. And if not, it’s all good. There’s always next year. Thanks so much. I had no idea that Tap Out was on display, and I’m thrilled that you took the time to speak out on my behalf. Enjoy the rest of your time at ALA.
I’ll go to the grave declaring the genius that is Tap Out. You deserve first seed in the votes, but I’ll take top 10. Thank you, but I wouldn’t call you greedy. You’ll be there and it will be awesome. In the meantime, let me know if you see any Quick Pick updates. I have no idea what the results are.